Your guests will go loco for this delicious cocoa! 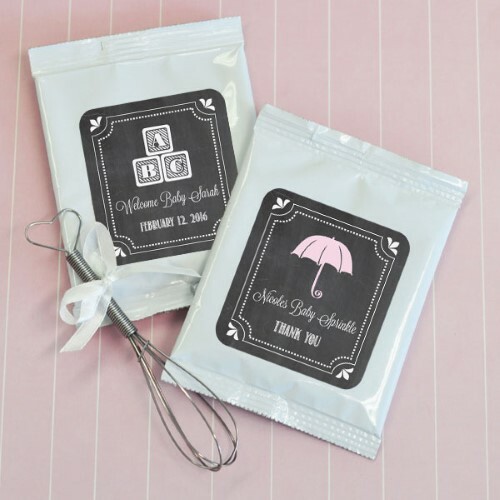 Provide your friends and family with warm feelings of happiness for your new arrival, with our Chalkboard Baby Shower Personalized Hot Cocoa. This tasty chocolaty blend is the perfect treat to your exciting shower. Let your guests cozy up from all that celebrating with a hot cup of cocoa. These sweet packs also come with personalized labels that allow you to add a touch personality to your favors. Add your names, message, and date to make these treats exceptionally unique to you and your new arrival.